My kids have been bugging me to have a paint night again. I haven’t painted anything since the last time I painted with the kids which was about a month ago, if not longer. The creative juices just haven’t been flowing in that direction lately. It’s been more writing and adventure building in Star Wars than anything else but sometimes a change is needed because I could feel myself starting to burn out. Recognising that need (plus the need to spend quality time with my children) is something I’m becoming much more acutely aware of and I try to act on it when I see it. It is often hard to arrange painting around my work schedule but last night was one of those nights where the universe aligned in our favour. I gave them the option of painting or playing some board games and they chose painting. Who am I to get in the way of the creative urge. The girls have long since decided that dad’s miniatures are cool but they would rather I paint them. They have been having more fun altering their littlest pet shop toys in various colour schemes and then getting me to seal them. While i twitch a little at the “misuse” of my brushes and paints I would much rather they be doing this than playing on their phones all night watching puerile youtube videos. So once dinner was cleared, we grabbed our gear and started to paint. 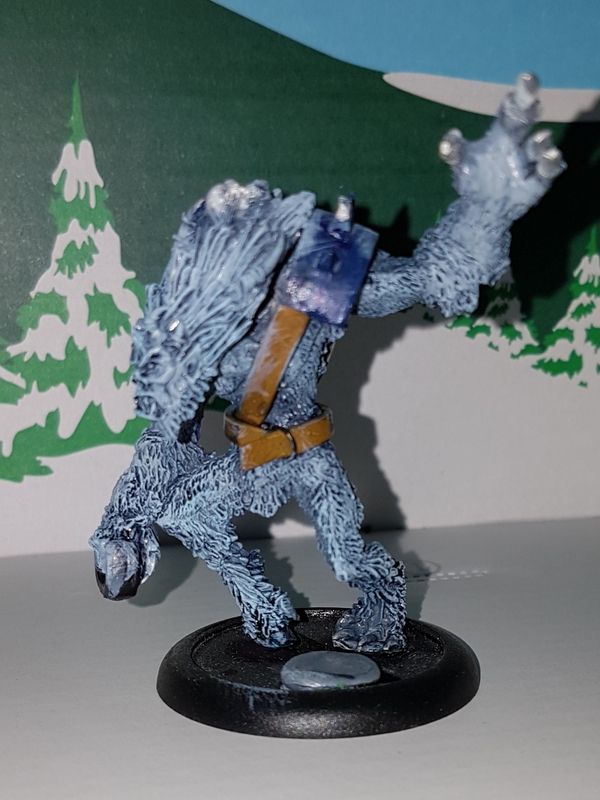 It took me some time to focus, like I said the creative muse was not with me paint-wise, but I did eventually get in to a groove and put paint on minis. I have so many ideas of what I want to paint I tend to be all over the place and put x colour on y miniature then rather than continue with the next colour on the same miniature I move onto a completely different miniature and different colour. The result is I often have a pile of 80-90% completed figures that I should finish but don’t. Last night however I grabbed an old mini that has been sitting at the 40% mark for the past 10 years or so and started painting with the goal to finish it. I broke out my new wet palette that I’d backed via Kickstarter and started painting. It was my first time using a wet palette and it was a dream. I’ve used palette paper lots but having the moisture that kept my paint from drying out was a godsend. It allowed for some very smooth blending of colours that I’d always have trouble with before. Unfortunately I did not get completely finished with the miniature but I’m a breath away from it and it makes me happy. I’ll post some pictures once I have access to the ones I took last night. The ghost on the left is a reaper miniature. 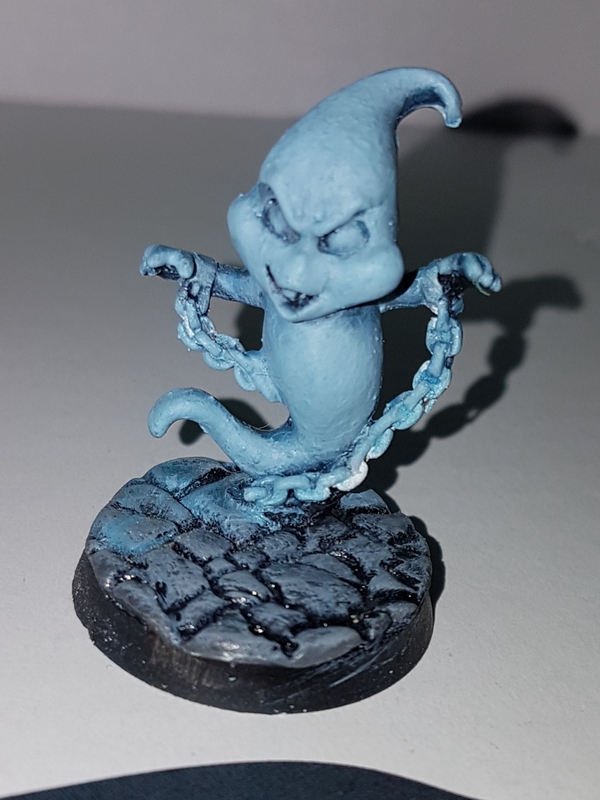 He’s a better example of the wet blending I was talking about. He’s still not done either, but he only really needs his chains, eyes and a bit of tidy up here and there to be done.